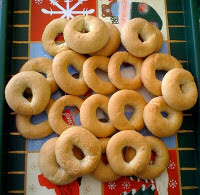 TheArmenianKitchen.com : It’s Christmas Baking Time! Flour…check. Sugar…check. Butter…double-check – and don’t forget the kadaif dough! It’s time to roll up your sleeves and start baking your favorite holiday sweets. If you have an Armenian - treasured Christmas baked good you’d like to share, please email your recipe to: robyn@thearmeniankitchen.com.